While ADJ’s reenergized Startec Series of portable party solutions has already seen the annoucement of the Stinger, Mini Dekker and Starburst, users now have another budget-conscious but brilliant effect to add to their lightshows: the Jelly Gressor. Combining six 1W LEDs (two red, two green, two blue) with a transparent plastic case, the Jelly Gressor is a forward-thinking derby moonflower that offers users distinctive 2-in-1 effects; emitting bright tri-color beams while the glowing case provides an additional, color-changing feature. Due to its vibrant colors and radiant case, the Jelly Gressor could easily be used by DJs and venue operators to add to the retro feel of neon/UV parties and club nights, which are increasingly popular with young clientele across the globe. Furthermore, with an immensely wide 140-degree beam angle the Jelly Gressor spreads its striking colored beams across large areas, enabling users to bring pure lighting excitement to every corner of the dance-floor. With its dual effects, wide scope and portability, the Jelly Gressor couldn’t be more well-suited to mobile DJs, entertainers and small venue operators, especially those looking for a low-cost solution that yields big, eye-catching results. What’s more, with no duty cycles and a low power draw (21W) the fixture will run all night and stay cool, having been designed with continuous, long-lasting operation in mind. The Jelly Gressor’s simple ‘plug & plug’ operation is also perfectly suited to its ability to go all night; the unit’s Sound Active effects incorporate a number of built-in color-change programs that see the unit’s moonflower effects jump to the beat of the music, while the case continually changes color. Whether used by a DJ, entertainer, lighting designer or small venue manager, this highly effective Sound Active operation and the unit’s ability to run continuously means that users can worry about the task at hand, safe in the knowledge that the Jelly Gressor will provide vibrant colored effects for the audience all night long. With its low weight of just 4 lbs. (1.7kg) and compact measurements of 10.75 x 10.5 x 4.25in (270 x 263 x 107mm), users can easily include the Jelly Gressor in their portable setup, while small venues can take advantage of its compactness to achieve far-reaching effects in limited space. Equipped with a single yoke, the fixture can be mounted above the dance-floor, stage or bar to create powerful, vibrant colored beam effects for the crowds or performers below, while the rear safety loop ensures safety for clientele and protection over the unit. For a more extensive lightshow that benefits from the effects of multiple Jelly Gressors, users can conveniently daisy-chain the power supply for up to 17 at 120V (or 30 at 230V), saving on extensive wiring and making setup and teardown of mobile shows a breeze. 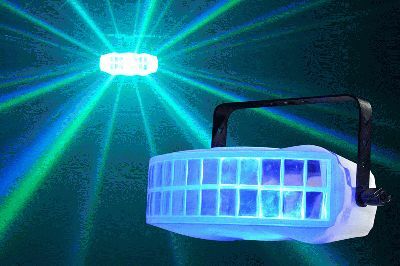 Whether used by party hosts, mobile DJs, bands, venues, stage productions, youth centers, or entertainment complexes, the Jelly Gressor is an affordable, portable LED solution that provides versatile 2-in-1 effects in an array of vibrant colors. Combined with the other unique products in the Startec Series, the Jelly Gressor will add far-reaching beams and distinctive glow effects to an already impressive lightshow, allowing users to create double the pure lighting excitement from one convenient source, without needing to spend big bucks.